I’m interested in poetry and the visual – poems that respond to art and other visual forms, works where words and images share the same space and/or use the space of the page in a vital way. 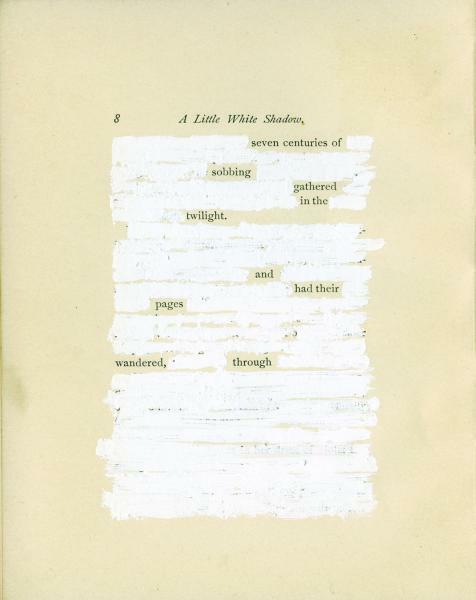 Poet Julie Mellor has been posting interesting examples of redacted poetry where words of a text are blacked out leaving other words here and there as the poem. I’m a fan of poet Mary Ruefle who is well known for using erasure as a compositional method. ‘White-out’ rather than redaction. 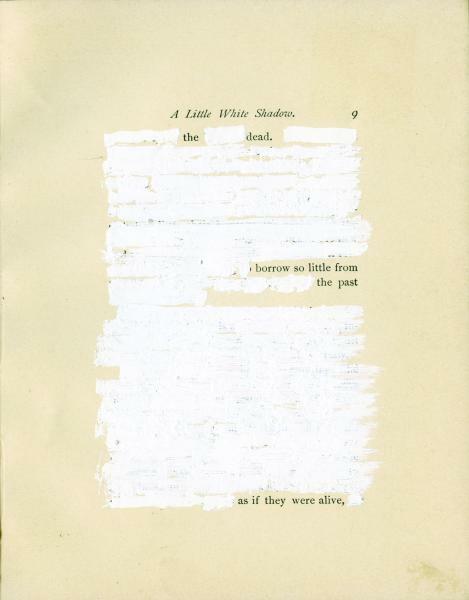 You can read more about Ruefle’s erasure method here. Here is Mary Ruefle talking about her methods. This is an interesting article in Jacket – are erased books defaced or refaced books? Jen Bervin is another poet who used erasure in fascinating ways, such as in Nets, where she erases each of Shakespeare’s Sonnets. New poems leap out at us and the deliberately applied white space makes that happen. We read the original sonnet in a new light. Here is an article the making of Nets. I used Bervin’s sonnets in a NAWE workshop on sonnets a couple of years ago to demonstrate how the altered poems throw different lights on the originals. I like the way the earlier text is ghosted in the background and the spare elegance of the new poems. Perhaps next time I’ll post some of my visual experiments. You make me want to try this. A really invigorating piece and it would be so good to read some of yours. Oh yes, do it! I’ll put some mine up in the next post. Thanks for introducing me to Jan Bervin’s work. I love the way the ‘Nets’ poems are presented, as well as how they read. Interesting post, Pam. I’m not familiar with redacts. Have you seen Tom Phillips’ ‘Humament’? Love Mary Ruefle. Have read her essays and met her in New York a few years ago when i heard her talk on erasures and reading afterward. She is dynamic, a real force of nature, but I am really not persuaded by the whole erasures thing, It’s the sort of tricksy stuff that just does not move or convince me, but then I am old and kind of old school with poetry thinning out in my life.